September 26, 2016. My first ever Franklin Half Dollar. 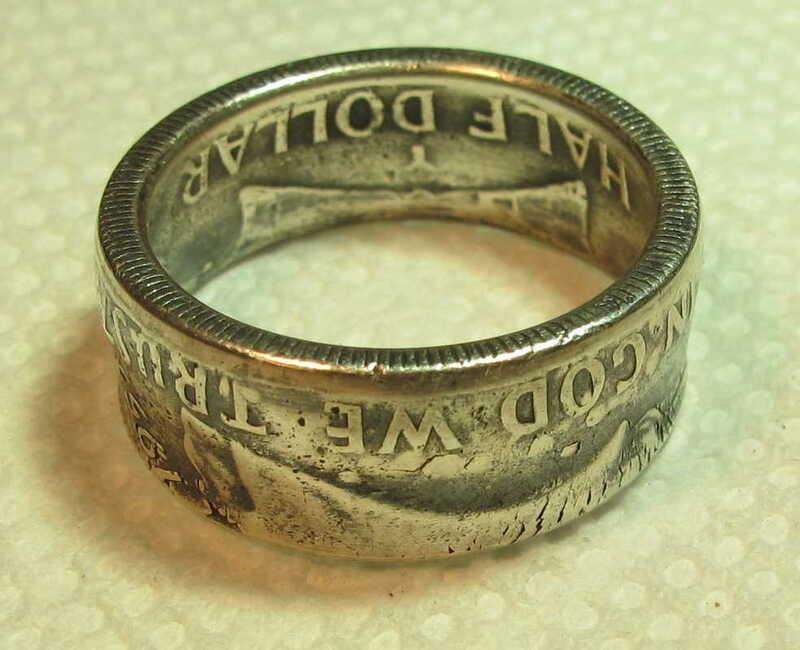 Being my first and a bonus of it being my birth year, I made it into a ring for a special keepsake. November 7, 2017. My 2nd Franklin Half Dollar ever, a 1954. Just 6 weeks earlier I popped very first Franklin a 1953-D. Just 6 weeks after I found my very first one. How wild is that? 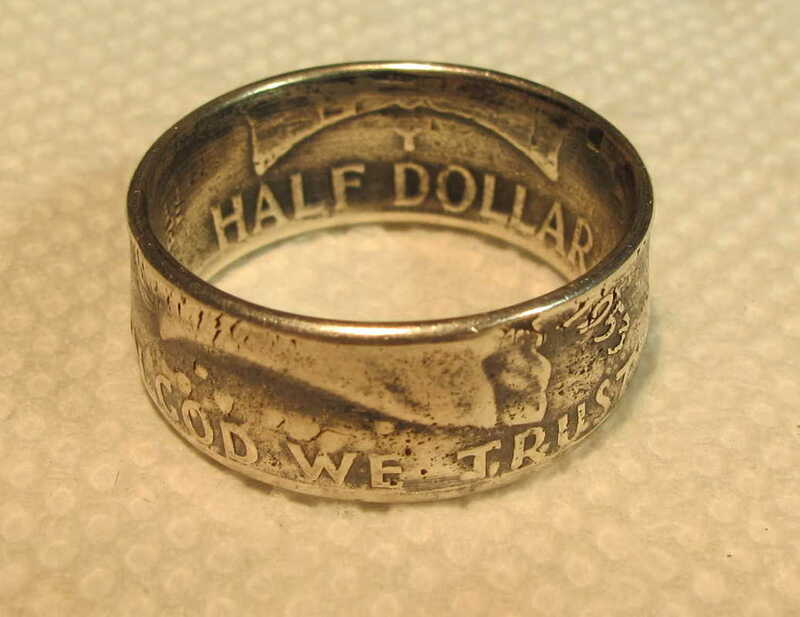 My first ever Franklin Half Dollar made into a ring. November 7, 2015. 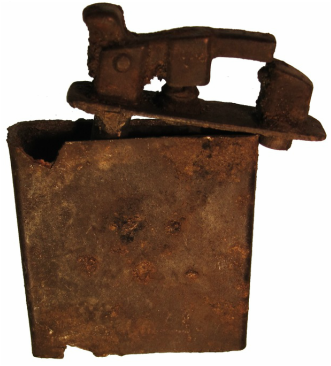 Neat old lighter. Found it in the same hunt as the Franklin Half Dollar. February 27, 2016. Camp Lanoche hunt. 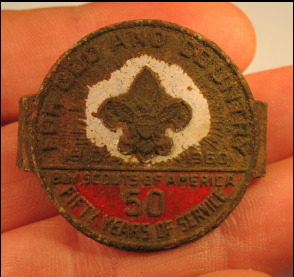 50 year anniversary Boy Scout slide. December 10, 2016. Neat find at an old homesite. 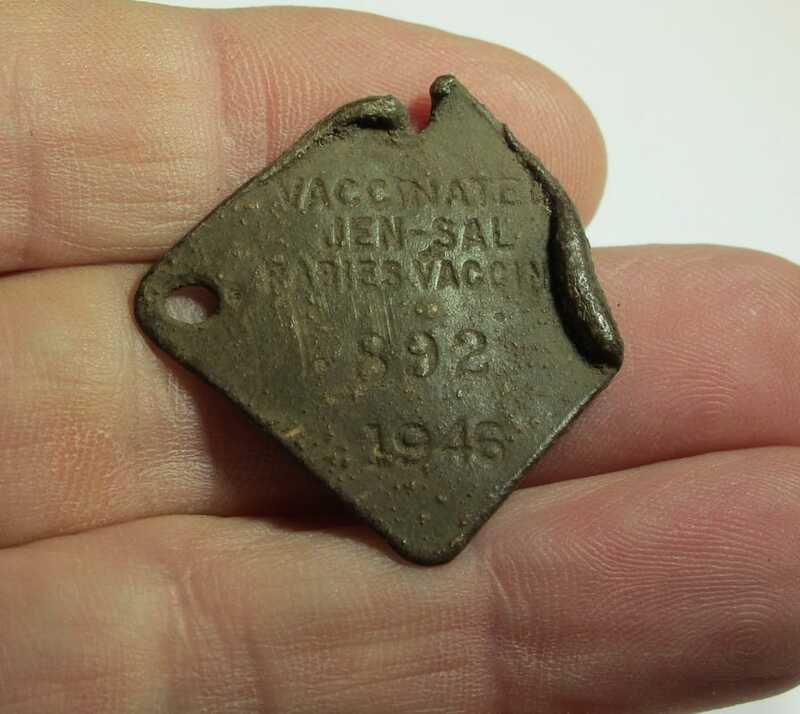 Dated 1946 Vaccination dog tag. 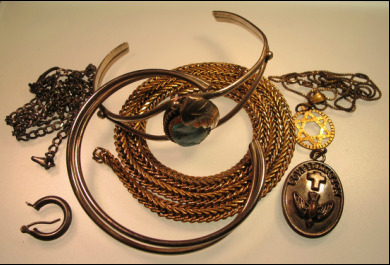 I find a lot of costume jewelry but this is some of the neater stuff. 2015/2016. 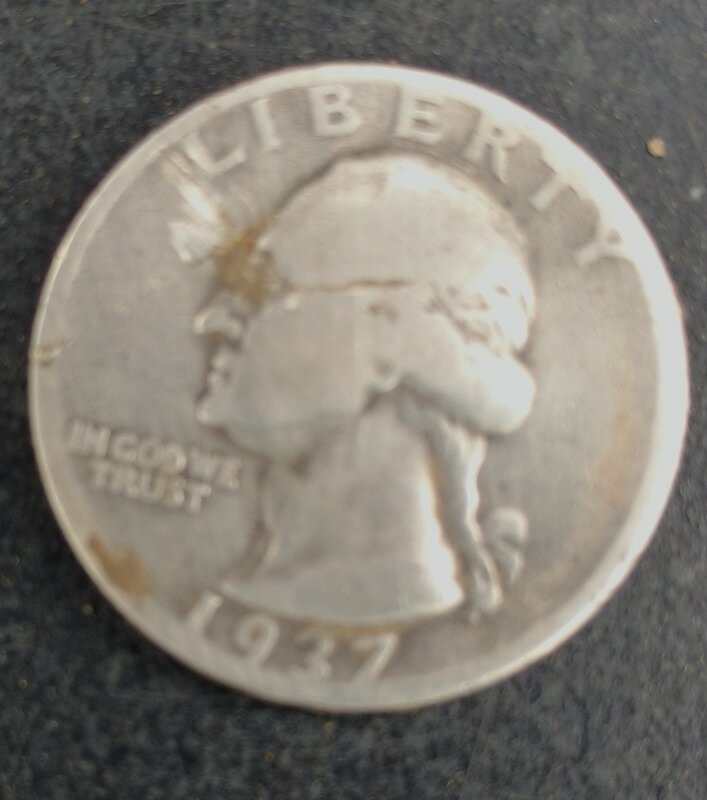 See the live dig YouTube video on this 1937 Silver Washington Quarter. Fun hunt in Chickamauga, Georgia. February 27, 2016. 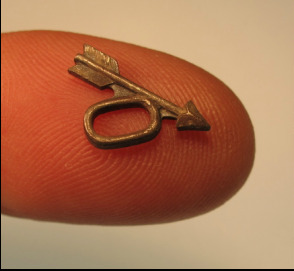 Boy Scout Order of The Arrow pin. October 10, 2015. Check these out. I was almost waist deep at Cocoa Beach and got a huge hit. Found one of these which led to 3 more. Must have been some type of ceremony in the water. July 4, 2016. I was detecting in the water at St. Pete Beach Florida when I recovered this beauty about waste deep and 8" under the sand. It was still running perfectly which is surprising as it turned out to be a counterfeit. Still a great find. Click on the image to see the YouTube video. January 19, 2017. Franklin Half Dollar. Cleaned up a bit. January 19, 2017. My third ever and unlucky Franklin Half dollar. 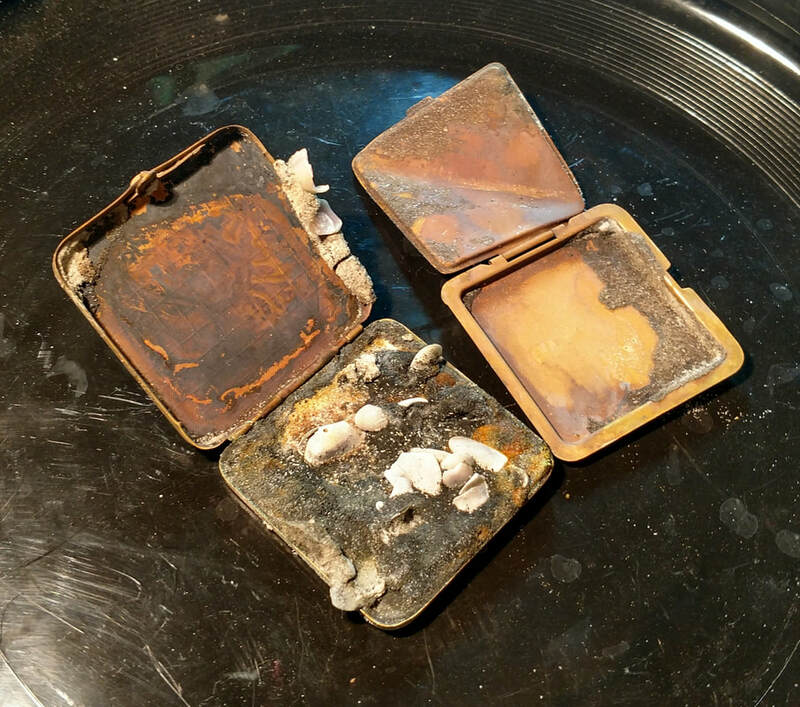 I went out detecting with FloridaJim in an old town city lot. Started at 8:00 in the morning and at about 8:20 dug my very first target, this 1951 Franklin Half. I called Jim over as I was very excited. I had left my camera in the truck and wanted to get it on live video so while he stayed at the dig area I jogged back to get my camera. On my way I stepped in an old post hole and down I went. Looked at my ankle and my foot was sideways. I popped it back in place, grabbed my video camera and limped back to get the video. That was to be the one and only target I dug. It is now 10 days later and I am still on crutches. OUCH! Just had to cancel a 4 day hunt in Maryland with a very good friend. Hope to get back to detecting soon. February 25, 2017. Boy Scout Campsite hunt. Five silver coin day. Mercury Head Dime. 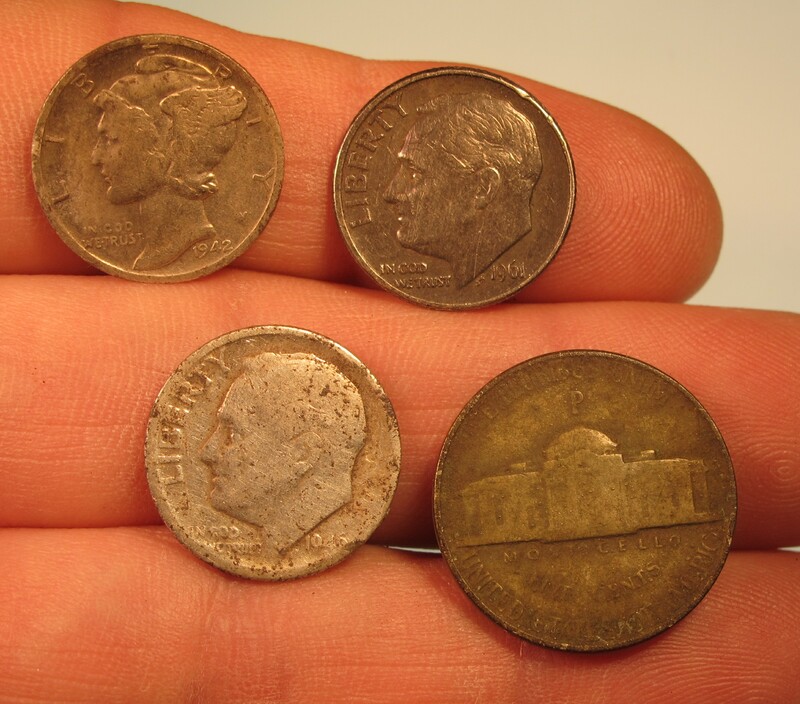 2 silver Rosies and 2 silver war nickels. October 9, 2017. 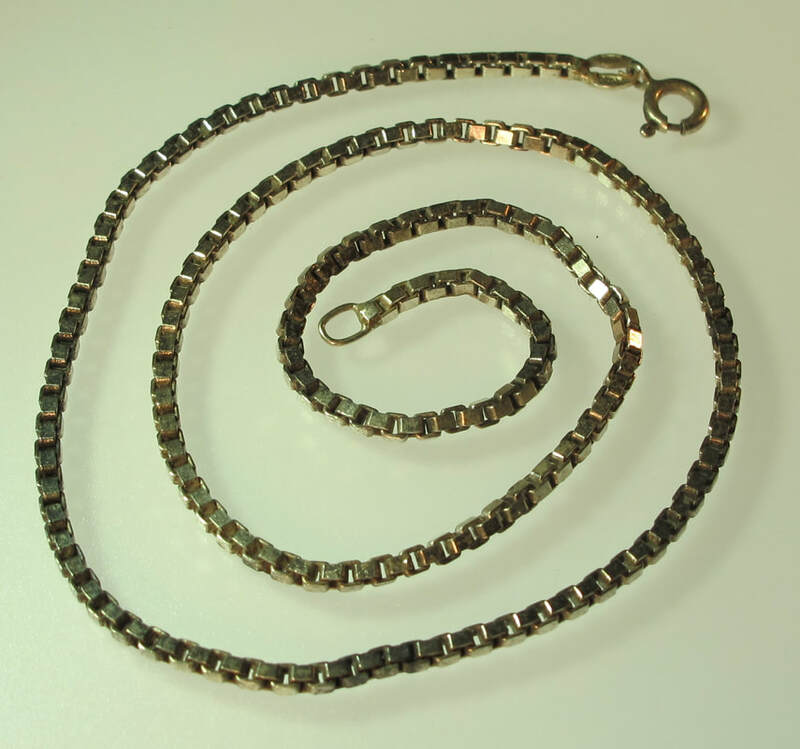 Nice heavy Sterling Silver Chain Necklace. Lake find. 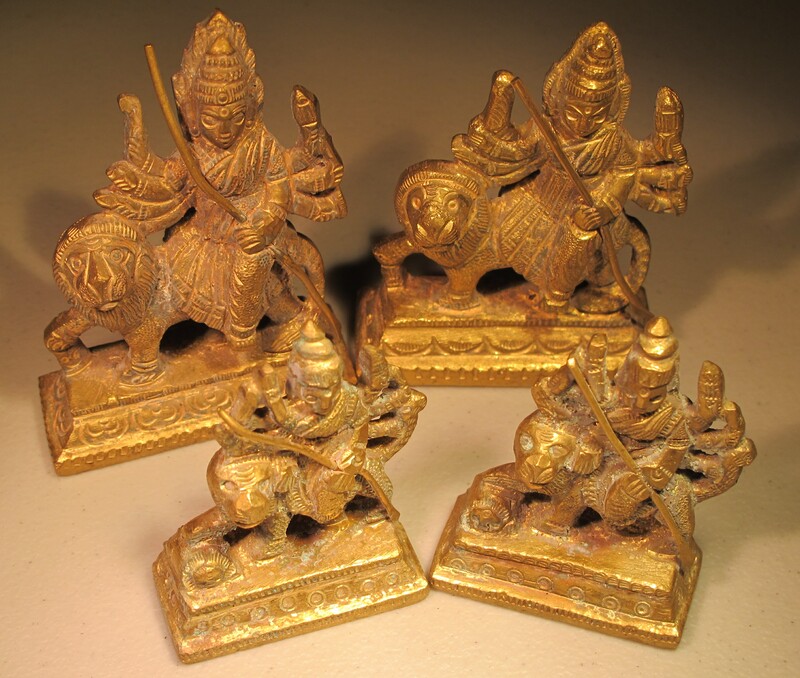 Very tarnished when found, cleaned up nicely. March 22, 2017. Daytona Beach find. 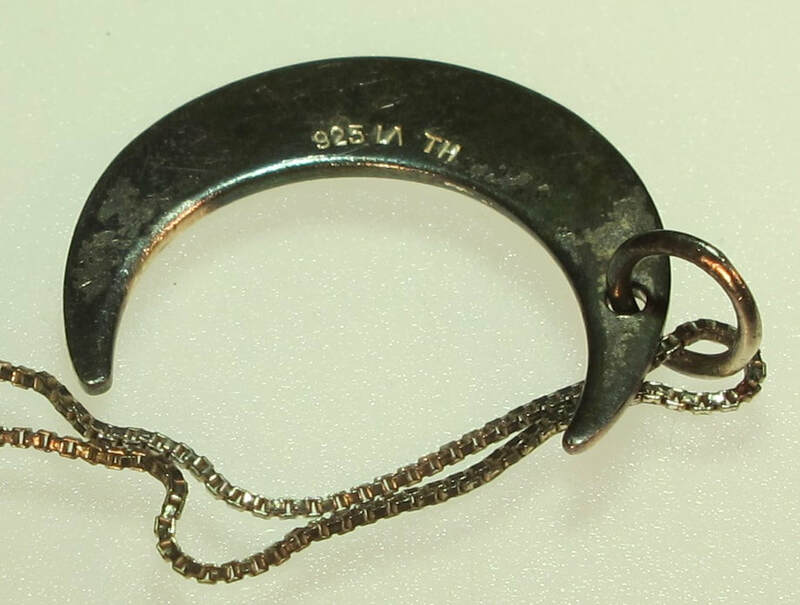 Nice Sterling Silver necklace. April 18, 2017. Lake find. Complete necklace and moon charm.Both sterling silver. August 9, 2017. Solid sterling silver earring. Beach find. April 22, 2017. Great find on some old church property. 1914 Script coinage. March 4, 2017. Cool old lock with the key hole cover still attached. Bigger than picture portrays. Found this at Florida Hunt 4 in Gainesville. March 27, 2017. Largest shell casing I ever found. Not sure of the calibur, maybe 100? Found in Central Orlando. June 15, 2018. My first ever Walking Liberty Half Dollar. Shockingly to me I popped this one on the beach at Daytona. My friend Scott was visiting from Maryland and JImmyCrossBones was with us. We found a very large cut in the hard pack sand and we were gridding it. I never ever expected to find a silver coin much less a Half Dollar. It was solid black and you can even see the sand stuck to it before cleaning. It's dated 1945 and the condition suggests it was probably dropped soon after it was put into circulation. November 11, 2017. Neat eyeball find. Hand painted Ladybug rock. I was detecting a vacant lot and this was staring straight up at me, Wierd feeling. October 15, 2018. Jiminy Cricket earring. Lake find, Very cool. May 26, 2017. Found this monster size token in an Orlando Lake. April 6, 2018. Front. 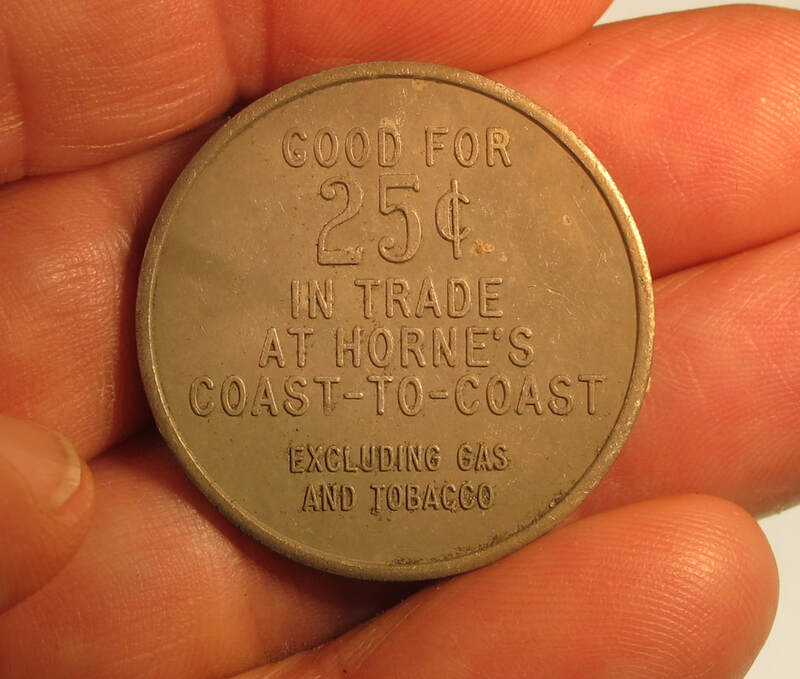 Half Dollar size Token. Lake find. April 6, 2018. Back. 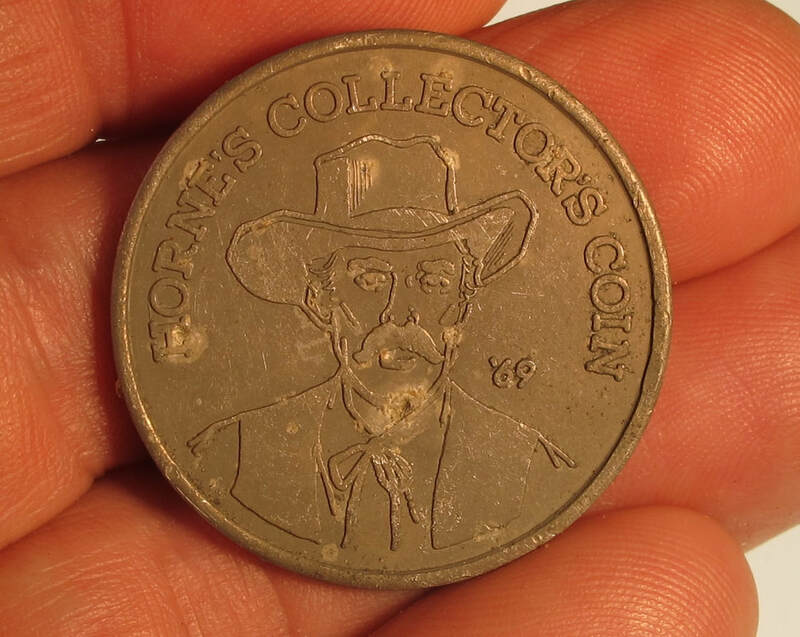 Half Dollar size Token. Lake find. April 6, 2018. Lake find. Local Orlando Token. Front. April 6, 2018. Lake find. local Orlando Token. Back side. June 26, 2018. 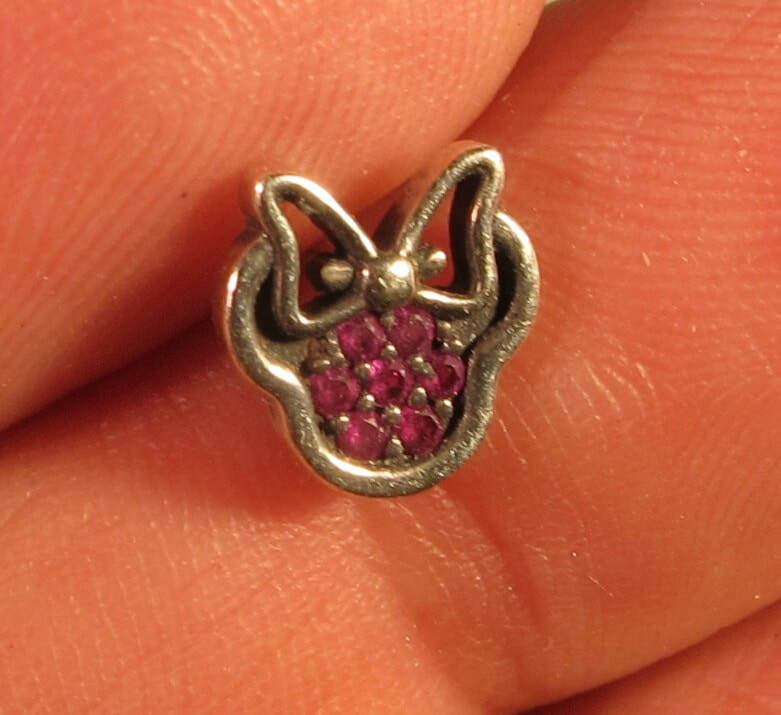 Silver Minnie Mouse earring. Another NSB find. Backside showing the Sterling Silver hallmark. June 22, 2018. NSB find. 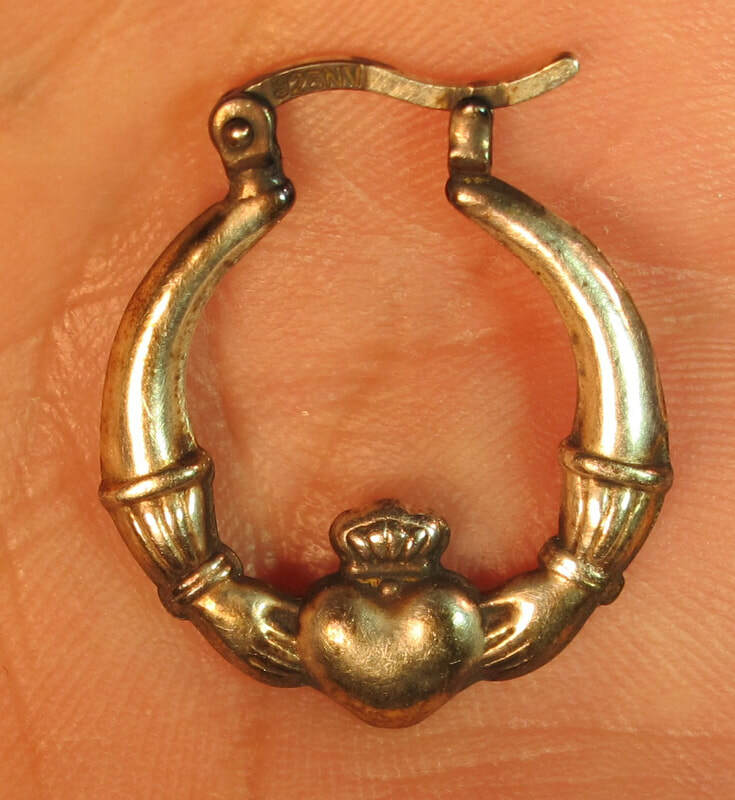 Old sterling silver earring. June 22, 2018. Big cuts at NSBeach yielded a couple weeks of great hunting. 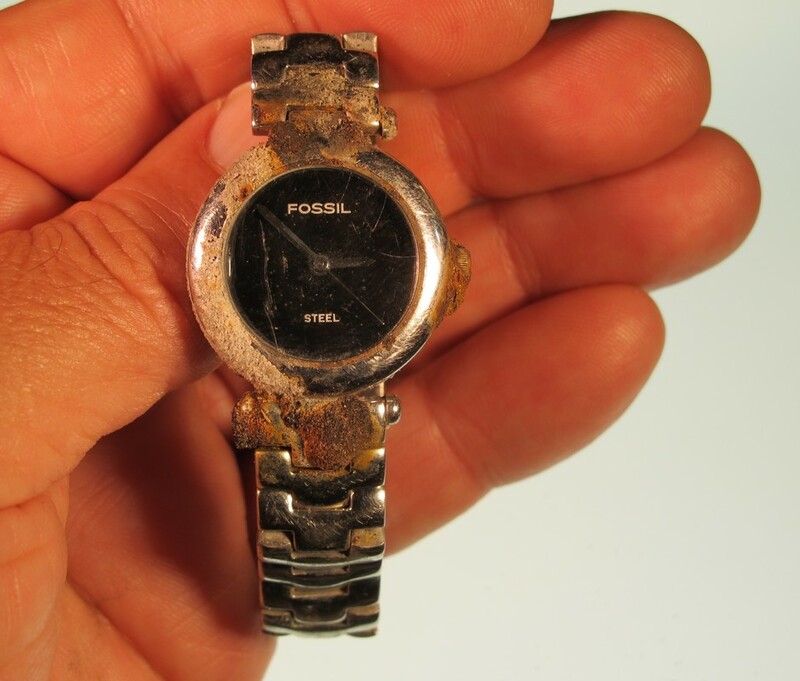 Fossil watch. June 22, 2018. Gold Filled (gorgeous) 50th anniversary medallion. NSB. June 24, 2018. Gold Filled Tweety Birk charm. Yet another NSB find. June 26, 2018. Old St. Chistopher medal. Part of the great hunt at NSB. August 12, 2018. Extra pretty earring. Not real gold but beautiful. Beach find. August 12, 2018. Classic Clasp Hands earring. .925 silver. Beach find. October 2, 2018. Stunner. Nice sterling silver. I was detecting at the party lake and when I brought up my scoop this thing staring at me. Creepy. CLICK on this to see the video. October 2, 2018. Very cool finding these tokens at the party lake. They are aluminum and about the size of a silver dollar, maybe a little bigger. I found 8 of these on this hunt and one on a previous hunt. They used to have an annual local Wipeout event there but no longer. They even had vendors set up out in the water and that is how all these tokens ended up there. 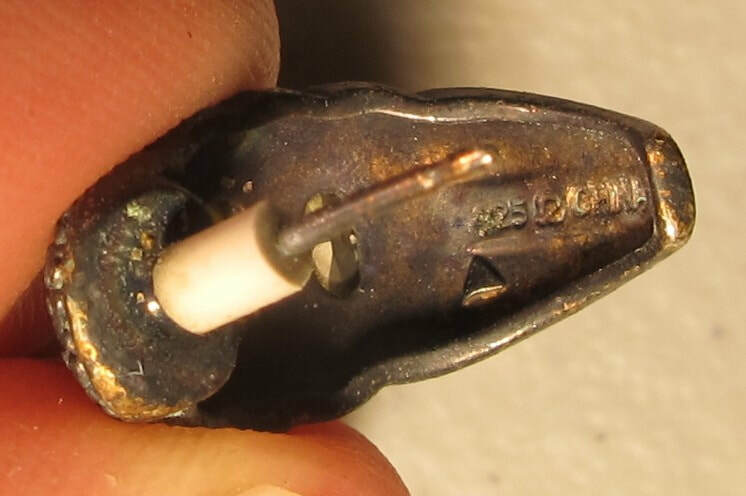 We have found a total of about 30 of these over the last couple years. Fun to find. October 18, 2018. Cool 1950's lead soldier with flame thrower. A 1930's house was torn down and I had received permission to hunt it.